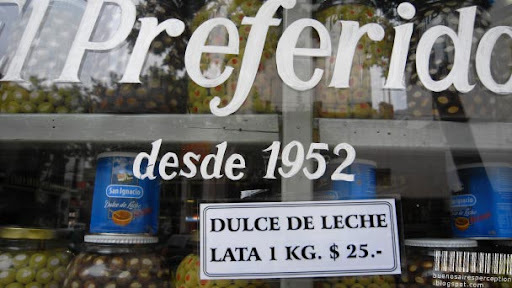 This grocery store sells 1kg cans of Dulce de Leche for about U$S6.5. Dulce de Leche is the true gold of South America, gold that is hoarded on your love handles to be exact. The sweet spread consists mainly of three basic components, sugar, milk and fat. It looks and tastes like a crème caramel dessert and can be spread e.g. on bread or toast. Actually, there is hardly a thing Argentinean wouldn't add some Dulce to. They have dulce de leche-flavored ice cream, cookies and cakes and even soda and other beverages. Wonderful post! I've never heard of dulce de leche before but it sounds delicious! I think I would prefer the olives in the jars. There seems to be an endless variety. It is everywhere in Ft. Lauderdale. Very rich. Sounds like some of the same stuff the ladies use here to make their skin beautiful. Great reflective photo! I want to try some DULCE de LECHE! Yumm, yumm!